Like the announcement of 2015’s The Avengers: Age of Ultron, this announcement references a classic Marvel character with decades of canon that, at the same time, many people probably don’t know much about. No worries- today’s installment of Geek 101 has got you covered! From The Official Handbook of the Marvel Universe, Vol. 1, No. 1, 1983. The original Ant-Man is a founding member of the Avengers. In 1962, Henry Pym, a brilliant scientist (did you ever notice there are no mediocre scientists in comics? ), discovers the “Pym particle” which can be used to change an object’s size. Pym promptly uses this discovery to shrink himself to the size of (you guessed it) an ant. After a dangerous trip through a local anthill, Pym realizes the potential of his discovery. A handful of other stories occur- he meets his future wife, the socialite Janet van Dyne. She gets her own exposure to Pym’s genius and walks away with the ability to shrink herself, a pair of grafted insect wings, and a bio-electric blast. Her superhero identity? Wasp. 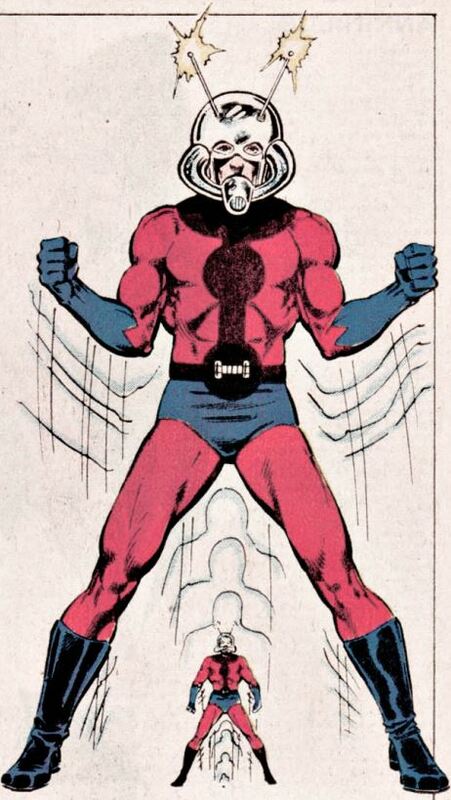 Henry Pym changed costumes and identities more than a Lady Gaga concert. He would reappear in different guises as Giant-Man, Goliath, Yellowjacket, and Wasp. (Yes, Wasp. It’s a long story.) He uses the Pym particles to grow in size as well as shrink. Along the way, Pym’s personality changes and he becomes Marvel’s face of domestic abuse as he hits his wife, Janet. (This is discussed in later years by some Marvel staff as the result of mental instability caused by exposure to the Pym particles.) In these different personae, Pym leaves and rejoins the team he helped found many times. Ant-Man, like many Marvel characters, becomes an office assumed by a succession of people. A thief who wants to put his crimes behind him, Scott Lang, steals the Ant-Man technology in order to save his daughter. After Lang proves his good intent, Pym gives Lang his blessing to take up the identity of Ant-Man as a hero. In a mid-2000’s storyline (“Avengers Disassembled”), Lang, now an Avenger, dies as a victim of an attack on the group. Ant-Man, the hero, is resurrected again as Eric O’Grady, a low-ranking S.H.I.E.L.D. agent who discovers the technology and puts it to his own uses. Various adventures, failing and triumphs, etc, etc, etc. I’m not devoting much space to O’Grady because I think he’s largely irrelevant at this point. Another fact that might work against Pym as the MCU’s next hero would be that Joss Whedon- the man who wrote and directed The Avengers and will be similarly creating the sequel movie- has shared his changes to canon as Tony Stark replaces Pym as Ultron’s creator for The Avengers: Age of Ultron. So does that make Lang the man inside the ever-so-small Ant-Man suit? Who created the technology? Does Pym remain in a far smaller role as simply the scientist- but not a super-intellect or hero? We’ve got ample time to speculate, debate, and rehash. Ant-Man is slated for a November 2015 release. Feel like sharing your thoughts? The Comments are right below- help yourself!